Do you need to get your business more business right now? We can help by managing your Google, Bing and Yahoo! online advertising (pay-per-click) campaigns and get you on the 1st page of Google in a hurry. We can help utilize search engine marketing to increase your visibility in search engine results pages primarily through paid advertising and beyond! Have you ever heard of SERPs? PPC listings? What about ad optimization or conversion tracking? All of these phrases and abbreviations are pieces of what makes up SEM, or search engine marketing. Google is far and away the largest in the search engine market, with Bing and Yahoo making up that last, small percentage. Search engine marketing is how you grow your traffic through search engines by utilizing paid methods. This buying of traffic as a result of paid listings is a common marketing practice and involves placing advertisements with Google (and others) in order to be seen by your target audience. For those looking to gain from Google’s vast empire of search results, Google AdWords is the tool to use. If your organic efforts haven’t panned out, then this is the next logical step. Pay-per-Click (PPC) advertising is a internet marketing model where advertisers pay a fee each time one of their ads is clicked by a potential customer. Basically, it’s paying to get visitors to your website. Once their on your website, it’s up to you to convert them to a customer. So, not only is it important to have the right PPC strategy and utilize the most popular keywords your potential customers are searching for in Google, Bing, or Yahoo!, but to have a professionally designed website or landing page for the campaign that converts the visitor to a customer. If you want to expand your reach into social media, we can also set up and manage your Facebook and Twitter campaigns as well. Does PPC advertising sound confusing and difficult? Well, it can be for a business that’s not familiar with PPC technologies and internet marketing strategy – or simply doesn’t have the time or personnel to devote to managing the online campaign. This is where we can help. We are PPC advertising campaign management experts. We take time to get to know your company, your products and/or services, your target market and demographics, and your competition. Based on our extensive market research, we develop the most relevant, exhaustive and expansive keyword list as the foundation of your online PPC ad campaign. 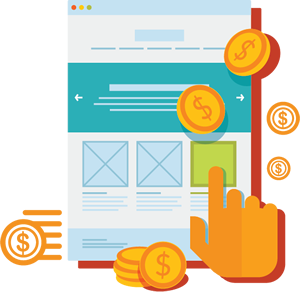 We also help you develop, a compelling, professional landing page for your PPC campaign that’s nicely designed, creates a good first impression and entices the visitor to contact your company for services, or to make a purchase. How do you know what we’re doing to manage your campaign is working? We provide you with weekly updates and monthly reporting on the status and success of your PPC ad campaign. Not only are you able to see the traffic being driven to your website, or campaign landing page, but we follow-up with you personally to make sure that you’re seeing visitors converting to customers. Everything we do is in an effort to drive traffic to your website and grow your business. Clicks are great, but customers are better! Many PPC management agencies will “farm-out” your campaign management to a third party, or use sophisticated technologies to handle campaigns in a fully automated fashion. We believe that no technology can take the place of personalized service. We take pride in managing all of our PPC campaigns for our clients in-house, with a real person managing your campaign and taking time to connect with you to verify real world results.